NeuroScale™ is a comprehensive, cloud-scalable platform for advanced processing and interpretation of neural signals, bringing real-time and offline brain & body state decoding and BCI to any device or application through a web API. Access signal processing pipelines for neural/biosignal realtime data and/or files, with functions such as artifact removal and filtering, data quality assessment, spectral analysis, 3D EEG source reconstruction, advanced brain connectivity estimation measures, source and channel event related potential analysis, physiological signal processing (ECG/PPG, EMG, eye tracking, etc), and more. Access turnkey pipelines for neural state classification and brain-computer interfacing using state-of-the-art machine learning paradigms. Upload EEG/biosignal recordings to the cloud, choose from a collection of turnkey pipelines, and generate HTML reports with a variety of quality and feature extraction analytics, complete with interactive figures. Reports can be generated for individual, multi-session, and multi-subject analysis. Reports generated by NeuroScale include a growing range of visual and interactive figures including ERP, ERSP, ERPimage, power spectrum, connectivity, statistics tables, multi-session and/or multi-subject plots, signal quality topoplots, etc., with more in the works. NeuroScale Streaming and NeuroScale Insights have an easy-to use, robust REST API that allows you run and configure a pipeline, send or stream data to a pipeline, and retrieve the pipeline output(s), with just a few lines of code in your favorite language. NeuroScale’s scalable architecture allows large numbers of users to connect to and use the service concurrently at any time, from anywhere. 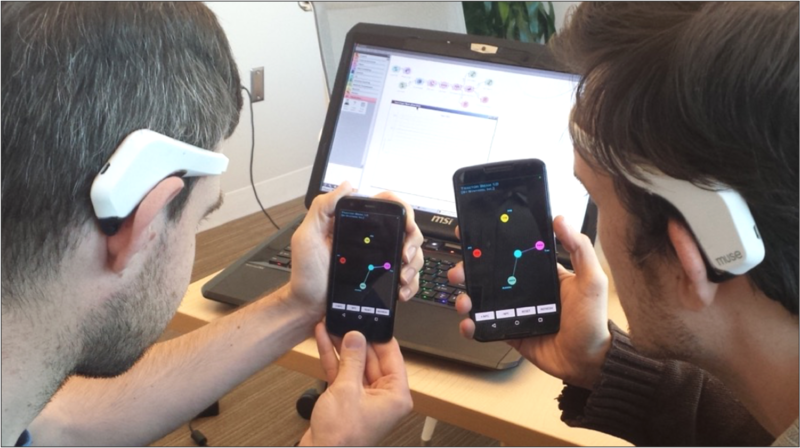 Using NeuroScale Streaming, many users can connect to a brain-computer interface application simultaneously, providing real-time brain/body state decoding, device control, and other uses. NeuroScale provides a flexible API allowing data to be streamed to/from NeuroScale and arbitrary hardware devices. Additionally, NeuroScale natively supports simplified data I/O with most consumer and research EEG hardware and over two dozen other device classes through the Lab Streaming Layer (LSL) and other industry protocols. (More details at neuropype.io). Neuroscale supports a variety of industry standard neural signal file formats for data input and output, including EDF, XDF, HDF5, SET, CSV, etc., along with a range of device-specific file formats for data input. In addition to EEG, NeuroScale can also process various other types of neural data including ECG, EMG, eye tracking, HID, motion, and more. These can be combined from multiple sources and processed together for multi-modal BCI applications and analytics. NeuroScale pipelines can receive and send multiple inputs and outputs simultaneously, whether device data streams, files, or both, and merge the streams for multi-sensor data analysis or to power a multi-sensor BCI. In addition to the turnkey pipelines available on NeuroScale, NeuroScale’s companion desktop application suite, the NeuroPype™ Suite, allows you to create your own pipelines by chaining and configuring functions from our large collection of processing “nodes”, and upload your pipelines to your NeuroScale account so you can run them from anywhere, anytime. See neuropype.io for details. NeuroScale pipelines are fully user-configurable through a set of exposed parameters, allowing you to specify channel lists, set artifact rejection thresholds, specify event markers, tune feature extraction parameters, and much more. Developers can use the NeuroScale Streaming API to easily add state of the art neural signal processing to their mobile applications, creating brain-powered apps that allow users to interact with IoT devices, measure and quantify their cognitive state and performance, and more. 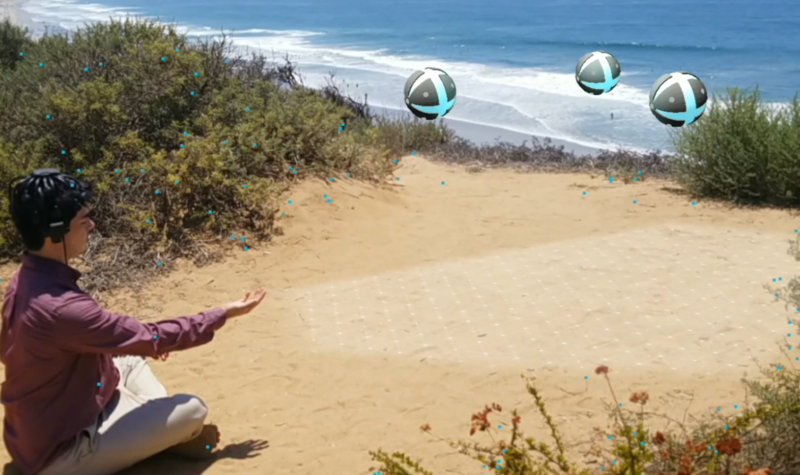 This has application across a wide range of fields including human performance, health and wellness, entertainment, human-computer interaction and VR/AR, scientific R&D, and the arts. 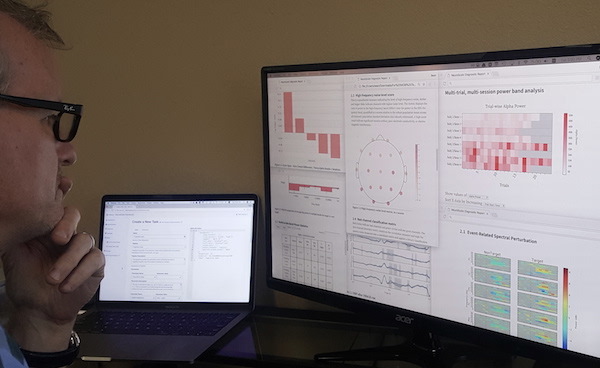 Researchers can use the NeuroScale Insights service to easily process their EEG and multi-modal neural signal data using parametrizable canonical pipelines based on validated methods, and generate processed data as well as visual reports for research analytics, papers, presentations, etc. Anyone with a NeuroScale compatible EEG device (see list here), can stream their own EEG or other physiological data to a NeuroScale pipeline and see a brain map of their bio/neural activity or processed neural data plot in a browser window, or send their data to a neural state decoding pipeline and use it to power their DIY project, create brain and body powered experiences, games, and installations, etc. Unleash your creativity! Batch process EEG and other biosignal data files. Generate interactive visual analytics reports and/or export processed data and results. Build your own pipelines in NeuroPype and deploy them to the cloud with one click to run from anywhere, anytime! NeuroScale accounts are currently being rolled out on a limited preview basis. To sign up for an account, please contact us using the form below. NeuroScale is not a medical product, is for information purposes only, is not intended to provide any medical diagnosis or treatment, and should not be used as a substitute for professional medical diagnosis or treatment.